Fancy carp are farm raised, being mutated magoi. Magoi, however, are believed to originate in Asia, from the Black, Caspian and Aral sea areas. Carp, the name given to undomesticated, uncoloured carp, were believed to have originated in Asia. A variant of the Asian carp is seen in Europe. Carp were introduced to the Americas as a gamefish but have now become a nuisance because when they feed, they root around in the mud, dirtying up lakes and rivers. Because of this classification as a nuisance, it is illegal to own them in several countries. Males are more slim. Females tend to exhibit a rounder shape. Can live with other large peaceful fish. Is not a shoaling species, but should be kept with at least 3 of its own species. Should not be kept with fish small enough to fit in its mouth because it will accidentally eat them. Koi are notorious for eating everything. High quality floating pellets are favoured by hobbyists. Koi are naturally benthic and feeding them floating pellets brings them to the surface for you to enjoy their many colours. Can be feed up to three times daily in the summer and late spring to increase growth. Reduce feeding to once or twice daily in the fall. Stop feeding when water temperature drops below 12.8°C (55°F) ; the Koi will eat algae from the bottom until the weather warms up again. Koi are very messy fish and produce copious amounts of waste. They should be kept in a large area with plenty of swimming room. Koi get their exercise by swimming vertically in the water column and should be provided with at least 2 feet of water in which to swim. 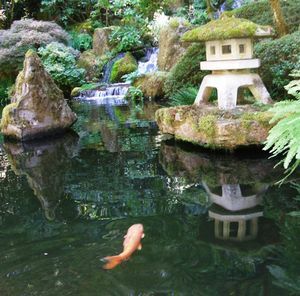 Depending on the predators in your area, you may need to make your pond deeper to allow the koi places to hide. Koi are very peaceful fish. They will mouth at a hand for food, but do not have teeth so they will not harm you. They can be skittish in clear waters, but this behaviour should abate as they become more comfortable in their environment. When young, Koi can appear very similar to common Goldfish. They can be distinguished by the set of barbels that are on either side of the mouth. They are also more full-bodied than goldfish and grow much larger than goldfish. Koi is an anglicized pronunciation of the Japanese word for carp “goi”. In contemporary usage koi refers to the selectively bred colorful mutations of Cyprinus carpio produced for appreciation rather than food. 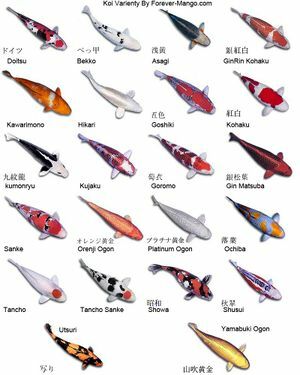 The Japanese and koi hobbyists around the word prefer the word “nishikigoi” (translated as brocaded, or colorful, or fancy carp). In Japan Cyprinus carpio likely has been introduced on several occasions. The oldest was probably around 200 BC based upon bones found in the Torihama shell-mound. In the 1600s the Dutch may have introduced a more directly European subspecies. From this stock the winter snow bound rice farmers of Yamokoshi started to selectively breed color mutations as for their amusement. In 1914 these koi, then called irogoi (colored carp) were introduced the wider world at the Taisho Expo. About this same time the carp variants known as Leather and Mirror carp were added to the gene pool as a gift from Germany. WWII interrupted the development of nishikigoi, and most parent stock was eaten during the food shortages of that period. Nonetheless nishikigoi famers still developed new varieties and the 1960s saw a nishikigoi boom time in Japan. The Japanese interest in nishikigoi has since waned and 90% of nishikigoi production in Japan is currently exported. Koi are a very trainable fish. They will begin to recognize the person who feeds them and come to the surface to beg for food whenever they see that person. With practice, they can be taught to eat from your hand. Koi come in a wide arrange of colours, scale patterns, and finnage. Scale patterns can be the traditional fully scaled body and the European variety known as doitsu-goi. Doistu-goi only have scales on the top and bottom parts of their body. The two types of finnage are traditional length and a longer version sometimes called dragon or butterfly carp. Kin-gin-rin - Koi with shiny scales. There are Gin Rin versions of almost every other type of Koi. This page was last edited on 8 September 2018, at 20:51.